A Library of Congress tour may not be on the top of the list for first-time visitors to Washington D.C., but it should be. The Thomas Jefferson building, one of three Library of Congress buildings on Capitol Hill, is open for public tours and is well worth your time. Completed in 1897, this beautiful building is decorated to honor learning, literature, knowledge, creativity, and intellectual achievement. If you are a book lover, you can’t miss it. 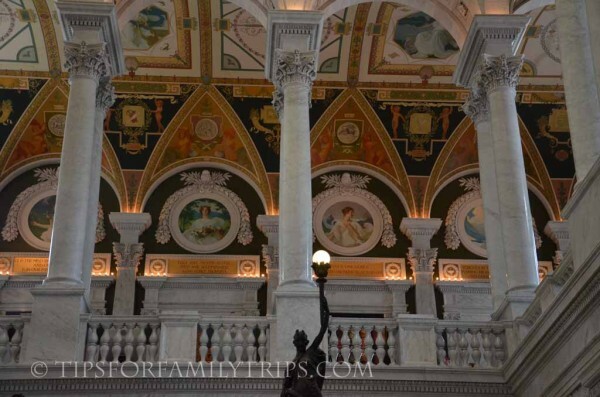 Here are my top tips for visiting the Library of Congress with kids. The Library of Congress is open to the public Monday-Saturday. I recommend you take a free one-hour docent-led tour. These tours are led by knowledgable volunteers who love the Library of Congress and are happy to share unique stories and insights that you will miss if you try to enjoy the beautiful building on your own. Check the Library of Congress website to confirm tour times, but they generally run on the half hour. If you cannot do a guided tour, check out the self-guided tours at www.loc.gov/visit/tours. There are no age restrictions on Library of Congress tours, but they are not particularly geared toward children. Touring with younger children may be challenging. If you do decide to bring young children (I’ve done it,) you can start the tour and slip out when your children are finished. The security officers at the entrance and exit may have Junior Officer stickers for children if you ask them. The Library of Congress showcases two of the library’s greatest treasures: a handwritten Mainz Bible and a printed Gutenberg Bible. The Gutenberg bible was the first bible printed on moveable press in Europe, around 1455. You can see them on the main level. Leave yourself plenty of time to explore the impressive exhibits. There are a number of permanent and rotating museum exhibits. You can see a replica of Thomas Jefferson’s library, which consisted of 6,487 books that Jefferson sold to the library in 1815 after the British burned the original Library of Congress during the War of 1812. Visit the map room to see the first known map that uses the word “America” to identify this continent (circa 1507). Take time to explore the amazing treasures inside the Library of Congress. The Young Readers’ Center at the Library of Congress is a great stop for families. It’s on the ground floor. Follow signs or ask for directions. You’ll find lots of picture and chapter books for children and teens. You can hang out there and read a good book or two if you’re ready for a break from walking and sightseeing. Story time, activities and special events are occasionally scheduled. Learn more at www.read.gov/yrc. You do not need a Reader Identification Card to visit the Young Readers’ Center. You do need a Reader Identification Card to access the books in any other part of the Library of Congress. Tourists are not admitted to the Main Reading Room and other reading rooms. Learn more about Reader Identification Cards at www.loc.gov/rr/readerregistration.html. The Library of Congress has a fun gift shop, especially for book nerds. You’ll find lots of unique gifts and souvenirs in this large shop. Library of Congress tours work very well in conjunction with a U.S. Capitol tour. There is a very convenient underground walkway between the two buildings. Access it from the basement of the Library of Congress, near the building exit. The beauty of using this underground tunnel is that once you’ve gone through security in one building, you can walk to the next without going through security a second time. Pairing this tour with a U.S. Capitol tour makes for a perfect day of sightseeing. I strongly recommend that you ride Metro to the Library of Congress. Use the Capitol South stop (orange/blue lines), exit and walk about 2 blocks north on First Street SE. If you insist on driving in like I usually do, you can park at Union Station, but allow yourself plenty of time. The Library is only about 0.5 miles away from Union Station, but it takes time to wind through the parking lot and Union Station. Give yourself at least 20 minutes to park, exit, and walk to the Library if you are planning to arrive in time for a tour. There is a limited amount of two-hour metered parking nearby. I successfully found free street parking one Saturday, but read the parking signs carefully since D.C. parking enforcement is very strict. Where: 10 First Street SE, Washington D.C. Just east of the U.S. Capitol. When: Open Monday-Saturday 8:30-4:30. Closed New Years, Thanksgiving and Christmas. Amenities: Restrooms, small gift shop. Picnic tables outside the exit. Need a place to stay? Allison has stayed at Kimpton Hotel Madera and other D.C. hotels, all a short walk or Metro ride from the Library of Congress. Read her review of Hotel Madera HERE. Click the button to check rates and read reviews at TripAdvisor. Do you know about Explorer Pass? Save up to 40% on admission to Mount Vernon, Big Bus Tours, the International Spy Museum, plus other attractions of your choice. Click the button to learn more about Explorer Pass. Genius article – thank you for these GREAT tips! What a gorgeous library – I can almost smell the books! Great information. I am looking forward to taking my kids to DC someday–so much history and impressive architecture! Great information. I always recommend to tour children with a docent or a guide, they get so much more out of it! Great tips. We are headed there this week. We are very fortunate to have a private tour set up with a family friend. Great tips. We are heading there this week. We are very fortunate to have a private tour set up through a family friend. Looking forward to it.